It’s the beginning of a perfect modern romance: You met on an app, and after engaging in some above-average banter, you’ve been on two drink dates and out to dinner at least once. You’ve finally saved their number in your contacts under their real name (as opposed to “John/Jane Bumble”), and you’re feeling good about moving out of the “hanging out” stage toward something more serious. And then, out of nowhere, your potential future mate drops a bomb —they’ve got debt, and lots of it. They’re carrying $100K+ in student loans. Do you walk away or stay? And if you do stay, who pays for dinner? 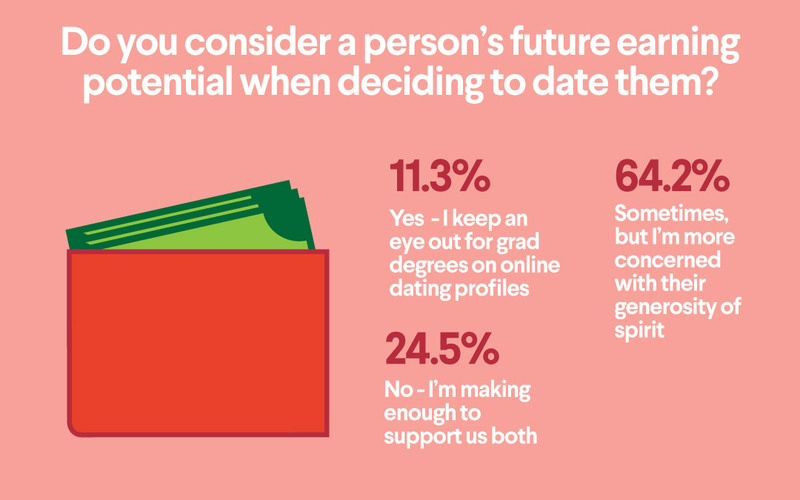 We’ve got debt on the brain year-round here at SoFi, but with Valentine’s Day just days away, we’ve got love on the brain too, so we surveyed 2,000 Millennials to learn more about how they think about debt in the context of their love life. Finding a Financially Savvy S.O. We all have certain qualities we look for in a potential match, and certain things we’d rather avoid, but where does debt fall into that mix? 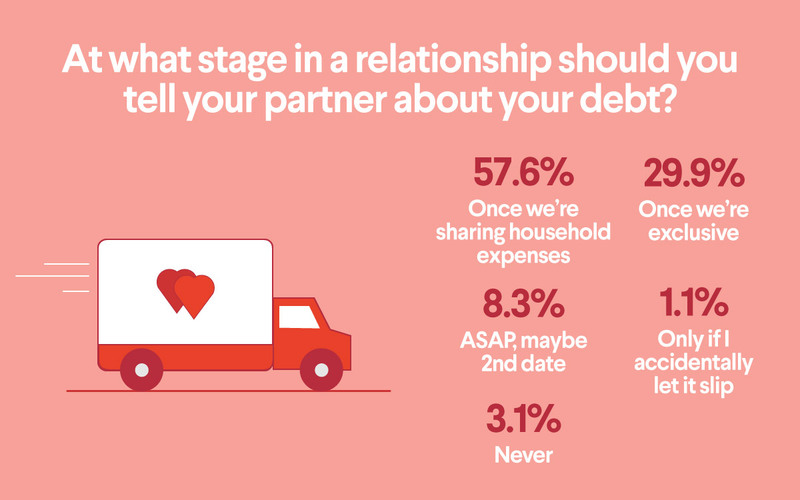 Of the Millennials we surveyed (ages 25-35), 20.9% said debt was a big deal breaker; it’s the second most concerning red flag when it comes to new romances. The first: being a workaholic, which is apparently worse than having no career prospects at all. Workaholics ranked top of the no-go list for 21.4% of respondents, while only 16.4% said a dead-end job would make them skip a second date. So when writing your next dating app profile, remember it’s all about positioning. “Overworked MBA grad with tons of debt” may not sound enticing to future suitors, but “ambitious young professional with tons of potential” will. We all bring baggage into new relationships, and talking about that baggage (debt included) can be anxiety-inducing. More than 39% of Millennials would rather disclose a pre-existing STD to a new partner than confess their outstanding debt. 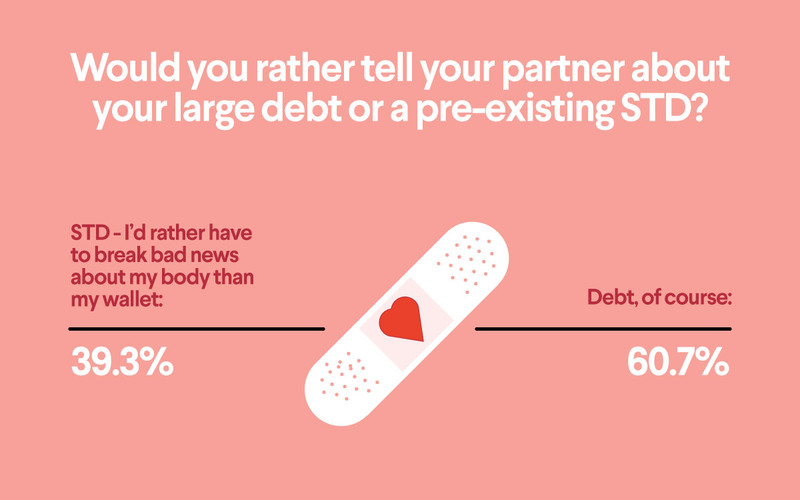 Assuming you’re part of the 60.7% who would rather talk debt than STDs, you might be wondering: when’s the right time to bring it up? There’s certainly a sweet spot here between too early and too late, but the vast majority of Millennials (57.6%) say that only once you’re seriously considering combining households and sharing expenses—whether that means moving in together or getting married—should you disclose your debt. Twenty-nine percent have the money talk earlier, once they’re exclusive with a new partner, but roughly 8% of Millennials seem to prefer the ‘rip the bandaid’ approach, telling their date about their debt early on, even as soon as the second date. Whenever you do get around to having the tough conversation about debt, we’re of the mind that honesty is the best policy, and most Millennials seem to agree. 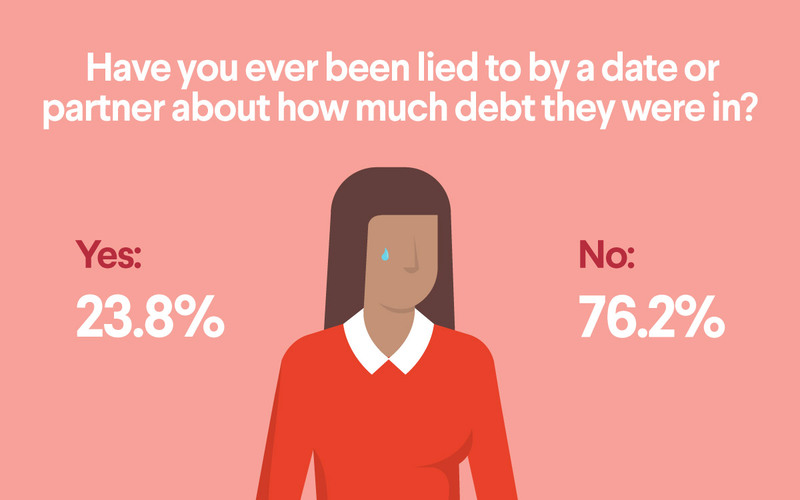 Unfortunately, not everyone plays by this rule: nearly 24% of our respondents told us they’ve been lied to by a partner about how much debt they were in. 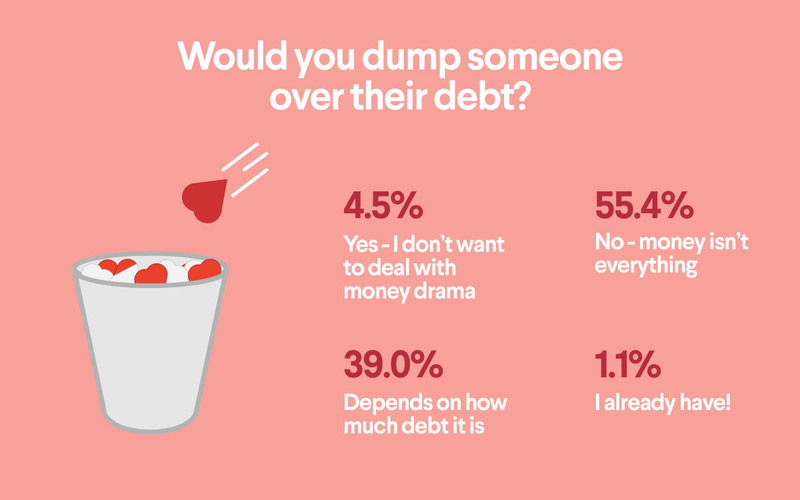 Can You Get Dumped Over Debt? At SoFi, we think of many types of debt as an investment made in your future self—like student loans to finance a degree, or a personal loan that you’ve used to consolidate credit card debt and get your finances on track. 55.4% of Millennials can, like SoFi, see the person beyond the dollar signs, and say they wouldn’t dump someone over debt. 39% on the other hand, aren’t so sure—they say it all comes down to how much debt we’re talking. 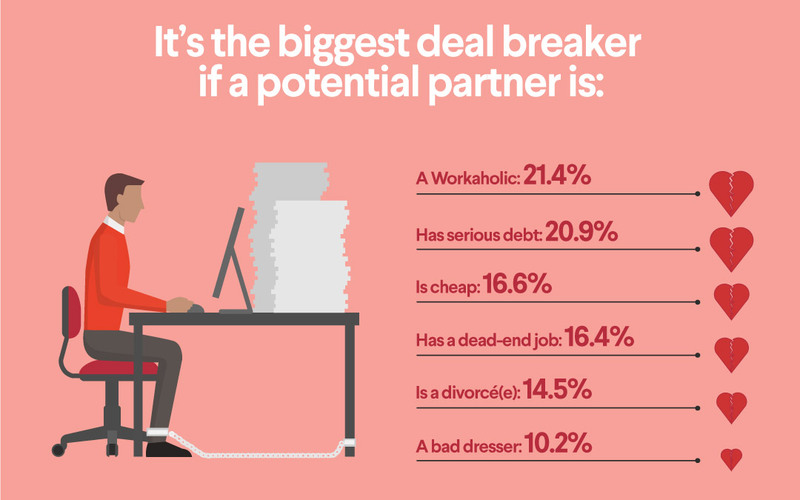 Those stats may hold true for dating, but when it comes to making the decision to settle down, how much debt is too much? 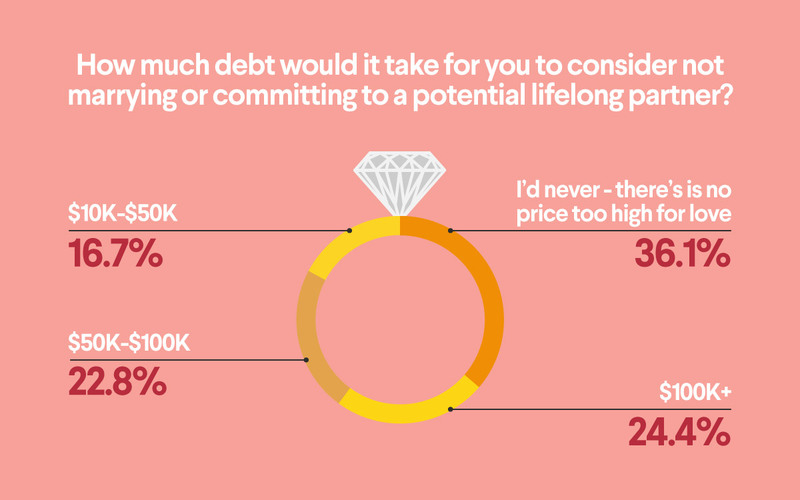 As you might imagine, the higher the debt level, the more likely Millennials would consider breaking it off: 24.4% say it would take $100K or more of debt for them to consider not committing to a potential partner, and 22.8% say anything from $50,000-$100,000 is a big enough burden for them to think about finding another mate. Sixteen percent have a much lower threshold, and say that just $10-50K of debt is enough that they’d consider walking away. As with any tough conversation in a romantic relationship, remember that being honest and vulnerable can go a long way toward building trust. And if you’ve made some missteps when it comes to love and money or need some guidance on how to combine your financial lives, check out our resources for overcoming financial infidelity and achieving financial intimacy. Have a date coming up? Check your rates to make sure your financial picture is as great as your dating app profile pic. The individuals surveyed for this article were not compensated for their participation. This information is educational in nature, is not individualized, and is may not be applicable to your unique situation. It is not intended to serve as the primary or sole basis for your financial decisions. It not only matters how much debt, but how the debt was incurred. Keep in mind, if you marry someone, their debt could someday wind up as your bill (but only if the debt was charged while you were married.) So, yeah…it would matter. Student loans? No problem. Sky high credit card debt? That could be a problem – I’d have to find out why they racked up so much money on their Visa. They were out of work for a period and hit the credit cards to supplement their Unemployment? Yeah, okay, that’s a valid reason…I JUST LUUUUUV shopping? That’s not and they don’t have the same values with money that I do. That’s the number one reason people split up – money problems. Shopaholics make lousy partners. I read that the one of the most accurate predictors for the success of the relationship is the similarity of credit scores between two people. And I believe it.